This is a versatile salad featuring two types of greens that come into their own in late autumn and winter: mâche (aka lamb’s lettuce) and Belgian endive. Mustardy vinaigrette sauce and plenty of garlic turn the leaves into a zesty salad that may be served as is or enhanced with walnuts, Alpine cheese and/or country ham. This adaptability will allow you to enjoy it whatever your culinary proclivity — omnivore, vegetarian or vegan. I enjoy making this salad when the days grow cool and short. This is when mâche appears at farmers’ markets in Paris. In the old days, that was the only place to find it; now you can buy it in a bag, which simplifies matters. Mâche is grown in sandy soil, and washing it clean can be a bit of a chore. The difference between the fresh and packaged sort is not significant enough to matter except for purists. Likewise, Belgian endive (aka chicory) is a winter vegetable, grown in two stages, the second of which takes place indoors in the dark. This ensures that its leaves stay white. These days you can find Belgian endive year round in France, but although not a purist I prefer it in the cool months, perhaps by association with past pleasures. 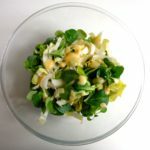 While either mâche and Belgian endive may be served on its own as salad, they pair nicely and can form the basis for a quickly prepared and tasty salad at lunchtime, with or without extra ingredients, or a salad course to precede or follow a main dish. The garlic adds zing, as does the homemade mustard vinaigrette, a French classic that also harks back to days of yore. 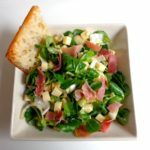 These days dressings made of balsamic vinegar and olive oil have perhaps surpassed mustard vinaigrette in popularity, and it is rare in Parisian cafés to find a salad bathed in a true vinaigrette rather than an ersatz version served out of a bottle. Making your own mustard vinaigrette is a minor culinary art form which, when mastered, takes about one minute. If you’ve never done it before, check out this video. The trick is to use more mustard than red wine vinegar. Another trick: if serving the salad after a main course, you can get started ahead of time. Just sprinkle the leaves with a little bit of freshly squeezed lemon juice to ensure that the sliced Belgian endive stays white, and add the sauce only at the last minute. This entry was posted in 3. Salads and tagged belgian endive, lamb's lettuce, mache, recette, recipe, salad, salade, vegan. Bookmark the permalink. Very timely recipe for your USA readers, as Romaine lettuce has been placed on the FDA uh-oh list due to some e. coli incidents. We’re all scrambling for alternate salad greens!